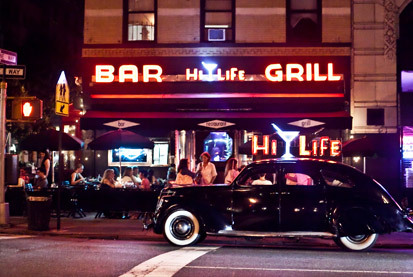 Hi-Life's vintage neon sign sets the stage for a classic NYC experience. The 1930s decor, art deco bar, cozy booth and banquette seating, and numerous flat screen TV's offer patrons various ways to enjoy the highly rated food and perfectly prepared cocktails. The menu features flame-grilled Burgers & Steaks w/hand-cut fries or mashed potatoes, daily purchased Fish, and "elaborate oversized Pastas and Salads". Also, Hi-Life offers Clams & Oysters schucked to order. The Raw Bar is manned by a traditionally trained Sushi Chef, who presents expertly prepared Sushi & Sashimi as a natural extension of our Raw Bar … now that's the Hi-Life!